I have a very hard time making drop cookies. I don't know what my problem is. Lack of a Sunset magazine looking, Bon Appetite magazine tasting cookie and I'm troubled. I tried again this week and while following the directions exactly, I ended up with definitely delicious, not quite as good looking cookies as I'd hoped to get. C'est la vie. These are chocked full of Twix candy bars and milk chocolate chips. 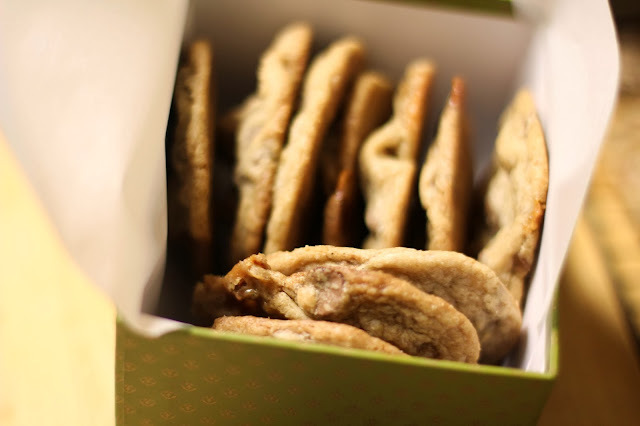 They are crispy on the outside, soft on the inside, and honest to goodness rivers of caramel flow through these bad boys. They are good. And I think they would be great with any other fave candy bar... Butterfingers, I'm looking at you. Sorry my picture has two eggs. I was mistaken. In a stand mixer or with a hand beater, cream butter, eggs, sugars and vanilla. Beat until butter and sugar are light in color and fully incorporated - about 5 minutes. While the butter mixture creams, in a small bowl mix together flour, corn starch, baking soda and salt. Add flour to butter mixture and mix until just incorporated. I mixed this by hand to make sure I didn't over-mix the flour. 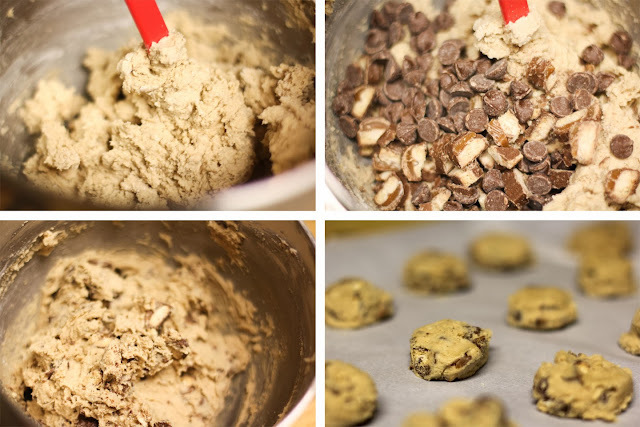 When flour is incorporated, mix in candy bar pieces and chocolate chips. I also folded these in by hand to avoid over-mixing. Line two baking pans with parchment paper and drop small balls of dough onto the paper. I used a 1.5 tablespoon ice cream scoop. Press the cookies down a bit to flatten them some. 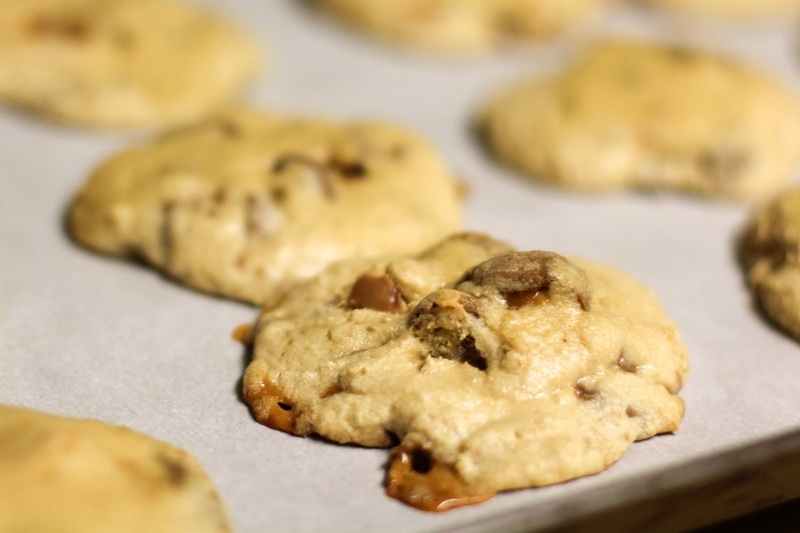 When cookies are flattened, place the baking pans in the fridge and let the dough cool for at least 2 hours. Pull baking pans out of the fridge and preheat oven to 350. Bake one pan at a time for 8 or 9 minutes. I liked the cookies better after 9 minutes. Cool on the pan for 5 minutes before moving to a cooling rack. I really do think this would be great with all sorts of candy bars, but Butterfingers are high on my list of things to try. Pumpkin Spice Cookies - Antoinette has no problem making gorgeous cookies!